The more I cook the more I am convinced that technique is my greatest ally. Quality ingredients like responsibly raised meat and sustainable, organic produce are also critical, but I would argue that a $15 organic chicken is no good if you can’t cook it well. A pie crust doesn’t turn out tender and flaky if your butter isn’t cold, and the freshest, straight-from-the-farm egg whites are superfluous in an Angel Food Cake if they are not properly whipped. Technique is what we have lost in the last few generations. Our great grandmothers couldn’t just run out and grab a DiGiorno nor could they turn to a Duncan Hines box mix. No, they were taught the basics of technique: how to roast, how to braise, how to bake, ratios. Technique. When you know the HOW (like how to roast a chicken), the WHAT (what to season the chicken with) is only limited by your imagination. Roasting birds has always been hit or miss for me, usually the latter. The technique outlined below is flawless. There is no need for a meat thermometer, no brining or marinating overnight, no trussing. There are three critical items to note: bird size (3 1/2 – 4 lbs. ), remove the backbone, follow the temperature/cooking time as directed. The first strategy behind this approach is akin to pounding meat with a meat mallot. Don’t worry, you won’t be taking a mallot to the chicken, rather by removing the backbone you create a flatter bird that cooks evenly. The other clever approach is to begin cooking the chicken on the stovetop. Have you ever roasted a turkey and ended up with sandy, dry breast meat and underdone dark meat? That’s because dark meat takes a little longer to cook through. By placing the bird in a pan and searing the dark meat (bottom) on the stovetop via direct heat you give it a head start on cooking. Then you transfer the chicken to the oven for indirect heat, which allows for the dark meat to finish at the same time as the white meat. You end up with a perfectly moist roasted chicken. Using sturdy kitchen shears, cut the backbone out of the chicken by laying the bird on its breast and cutting just along either side of its spine. Alternatively, if using a knife, set the bird on it’s bottom and slice straight down along each side of the back bone. The bird should open much like a book at this point. Lay the chicken cut-side down and in one firm press crack the breastbone (you will hear a little crack) to create an even flatter bird. Cut slits halfway through both sides of the joints connecting the drumstick to the thigh and cut through the joints of the shoulder under the wing, which will also help encourage even cooking. Season the chicken as you see fit. This time I smothered mine with a tablespoon of clarified butter and rubbed in a generous teaspoon or two of Herbes de Provence along with a little salt and pepper. 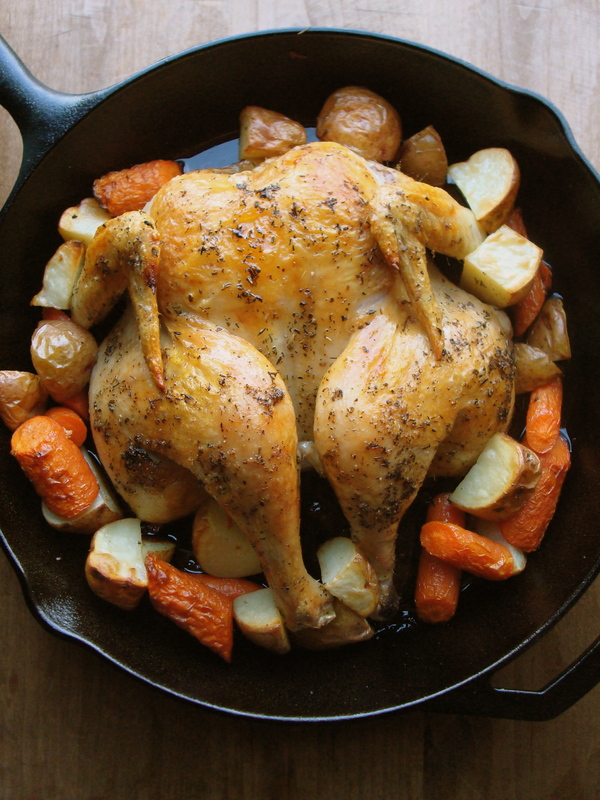 Once the meat is seasoned to your liking, heat a large cast iron skillet or metal pan large enough for the bird over medium high heat until a droplet of water sizzles on the surface. Place the chicken cavity (cut) side down in the pan and cook for 5 minutes. This is also when I arranged my medley of cut veggies around the chicken. Transfer the pan to the oven to finish cooking and bake 30-35 minutes until the skin is golden brown and crispy. Remove pan from the oven and allow the bird to rest 5 minutes before transferring to a cutting board to rest 5 minutes more. Cut into pieces and serve.